The holidays are fast approaching and everyone is getting ready for those big family dinners. I found myself looking through cookbooks, or the online virtual version of a cookbook, last week searching for a new fun food recipe to delight my own family. 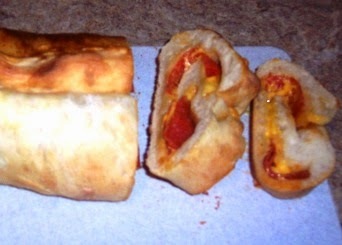 I came across this awesome Pepperoni Bread idea and recipe! I am pretty excited about this recipe. It seems like every year I need something to serve between meals. Someone is always hungry when our family gets together and entire dinners take hours to cook. Since my entire family loves bread and pizza, this pepperoni bread recipe looks like the perfect in-between meals snack or appetizer. One of the things I like best about Sam's recipe is that he gives us really easy instructions to follow, which mean just about anyone could make this bread. He starts with a basic and simple yeast bread dough recipe. As with any yeast dough, you will need to let this bread dough rise for an hour, so be sure to plan ahead. When the bread dough is ready, you simply place the pepperoni and other ingredients on the spread out dough. Sam does an excellent job of explaining exactly how to layer, roll and finish the bread roll to bake a delicious Pepperoni Bread. Ingredient and Directions for How to Make Your Own Pepperoni Bread can be found by simply clicking this link! I haven't tried Sam's pepperoni bread recipe yet, but I really need to. This is perfect weather for enjoying a treat like this one. Thanks for sharing, Cynthia! Thanks for the recipe, Sam! I haven't made Sam's pepperoni bread recipe, but my son makes a similar dish ~ he uses pizza dough and instead of pepperoni he puts cooked ground beef, mushrooms and onions and mozzarella cheese in his bread roll and serves it with pizza sauce. DE-licious!